Mark Moran The University of Queensland. 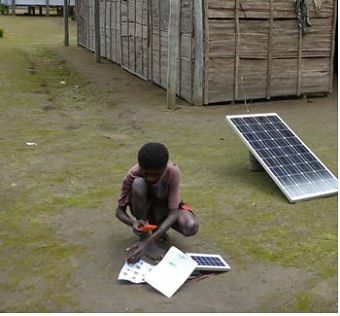 A student does his homework near a solar power kit in remote PNG, apparently charging his phone, or looking up something on the Internet. Geoff Miller University of Queensland. If you set out by dinghy from the northern-most inhabited part of Australia, you will make landfall fairly soon in Papua New Guinea (PNG). PNG, a country often overlooked by the Australian public, is enjoying the fierce competition among foreign powers for influence in the country after APEC ended in stalemate and heightened US-China tensions. APEC was held in Port Moresby, PNG’s capital, earlier this week. For PNG, the attention may well translate to development funds. Already, the US has pledged to work with Australia to upgrade Lombrum naval base on Manus Island, in what is widely seen as a counter to rising influence from Beijing in the region. But if foreign powers really want to make a difference to PNG, one of the poorest in the region, then funding equipment like telecommunications gear and solar power kits would be widely welcomed. One key benefit would be using mobile phones to transfer money – instead of traipsing long distances to a bank in town. No fewer than 85% of PNG citizens live in rural and remote areas, it is estimated – so items like these are capable of making an enormous difference in their lives. Much talk of infrastructure of late has involved the heavy duty type – ports, rail, military bases and the like. But as we all know, the biggest revolution around the globe is internet access. 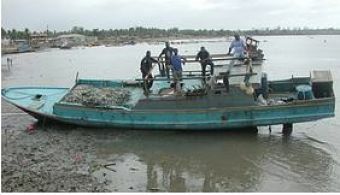 Fishermen at Daru, the capital of PNG’s Western Province, pictured in 2006, as local police cracked down on illegal fishing. Royal PNG Constabulary. Stepping into remote villages in the South Fly, one is viscerally confronted with the lack of national expenditure or international finances of any kind. Life in rural PNG has been described in terms of its “subsistence affluence.” The people are friendly and the land is fertile, with reliable rainfall. But the lack of roads or public transport, and access to cash, means that opportunities for enterprise and employment remain extremely low. Everyone is searching for markets for their produce and crafts, so they can get cash to buy consumables and health services, and pay school fees. One option for transferring money in these remote areas is via mobile phones. Recent research by Tim Grice found that people living in urban centres and rural towns in PNG are already using mobile money to send money to one another. It is yet to take off in the South Fly but it could do soon, as people are already exchanging mobile phone credits used to top-up their phones. Across the South Fly, villagers receive money from relatives living in urban centres like Port Moresby – or from Australian relatives in the Torres Strait – through the mail service Post PNG or the “bricks and mortar” Bank South Pacific (BSP) branch in Daru. Households affected by the nearby Ok Tedi mine receive compensation payments into their bank accounts. The payments relate to extensive environmental damage to the area, especially the Fly River, when BHP Billiton operated the mine. But this could be done via phone payments too. And then there are public servants or retired public servants, who burn up much of their government pay or pensions just to get to the bank and back. Mobile phone payments would improve life here too. In the South Fly, officials get payments from the PNG government for community work projects. These officials keep careful records of the hours each villager works, but sometimes spend months in Daru, repeatedly asking the district administrator to release the funds. When the funds finally arrive, the elected official journeys home, surrounded by relatives as bodyguards, and hand delivers payments to each worker. Much of the money goes on transport and accommodation in Daru. Again, this money could be sent via mobile phones. PNG’s new Ireland province tested the idea of social payments for aged and disability pensions – with great success. The World Bank assessed the idea and said an electronic payment system was needed across the country. In many South Fly villages, the shared mobile phone is found dangling from a tree or a window, in the one place where reception appears intermittently. A lack of infrastructure maintenance and coastal corrosion have seen mobile phone coverage in the South Fly deteriorate. Work is underway to replace failing towers, ahead of moves to bring in 3G internet coverage. 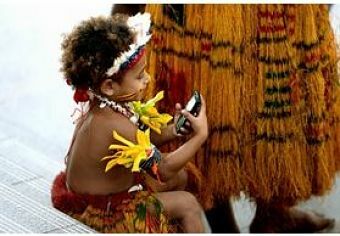 A young girl in traditional dress uses a mobile phone as she waits for then Prime Minister Tony Abbott in Port Moresby in March 2014. Alan Porritt/AAP. The cost of installing and maintaining mobile phone infrastructure is lower than building roads across river deltas and flood-prone savannah. And the higher the demand for transferring money via mobile phones, the more viable an upgrade to mobile coverage becomes. International donors like China are increasingly funding infrastructure projects in PNG, though often with strings attached. Australian Prime Minister Scott Morrison just announced an infrastructure financing facility. Two major mobile network operators, Digicel and B-Mobile, already provide mobile money services in partnership with BSP, Westpac, and ANZ. Foreign aid could be distributed this way, to a community-based organisation, for example. And cash flowing in means better-off citizens and more economic activity. Another big potential benefit to all this could be tackling absenteeism among teachers and medical workers. They are often off work travelling long distances to towns to get their pay and do grocery shopping. But there are risks. Giving the cash directly to people and organisations – where previously it was funnelled through the central government – will fundamentally shift the politics between citizens, leaders, bureaucrats, and international actors, and not necessarily for the better. Some people who may be benefiting from current arrangements may oppose change to protect the privileges they enjoy. PNG is a place of great complexity, with a development landscape littered with failed efforts. If such changes are made, there will be winners and losers – but surely it’s worth considering new approaches, given how little money is getting to these villages now. Mark Moran Chair of Development Effectiveness The University of Queensland.